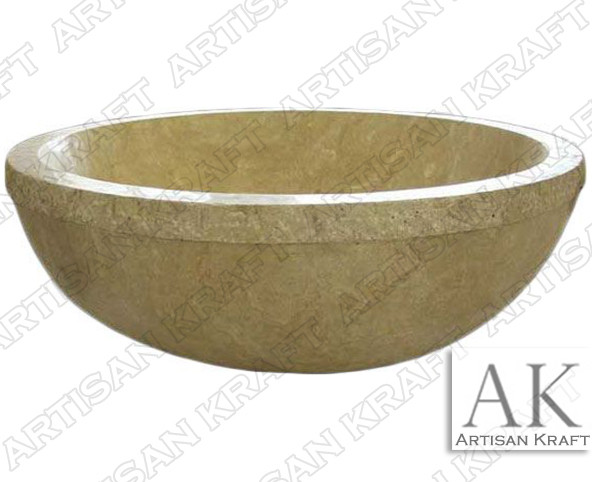 Oval bathtub carved from one large piece beige travertine. This is a large bowl shaped travertine tub. Travertine is a natural stone that comes in a variety of colors. These bowl style stone bathtubs come in a variety of materials. Full ring wraps the top of the lip. This ring can be taken away for a more modern styling. Take a look at our large collection. Call for installation details. Lead time is 8-12 weeks make sure to order in advance. Copper bathtubs are also offer by Artisan Kraft.